A Mejlis member says Crimean Tatars should represent Ukraine's diplomacy. 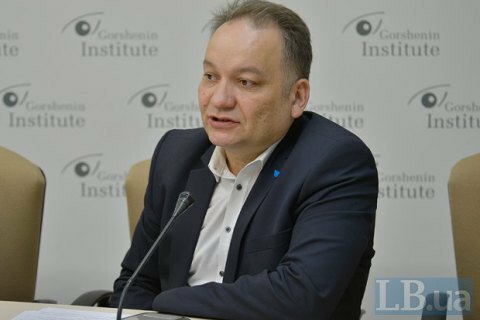 Ukrainian society has no clear understanding of the problems faced by Crimean Tatars while every Ukrainian must be a potential carrier of information, says Eskander Bariev, a member of the Mejlis of the Crimean Tatar people, during a roundtable conference at Gorshenin Institute on Tuesday. The politician believes that journalists, politicians, culture figures and general public should join efforts to work out an ultimate strategy and a plan for its implementation, which, in his opinion, will eventually help the problem of Crimea to be resolved at the international level. "I'm concerned that the repressive machine of the Russian Federation through intimidation will force Crimean Tartars to give up membership of the Mejlis. I am sure the Crimean Tatar people will endure but we need to work more vigorously because Russia uses powerful tools, both financial and diplomatic. Wherever we get to make a speech, we get three or four responses from Russia," Bariev argued. In this context, the representative of the Mejlis stressed the need for a comprehensive work with the indigenous Crimean Tatar people, to bring representatives of the Crimean Tatars "to the level of international diplomacy." "In cooperation with the Foreign Ministry and the Diplomatic Academy, we have developed a programme of training seminars for Crimean Tatars aimed to prepare them for diplomatic activities - explain how these mechanisms work, how to behave, and how to convey information," said Bariev. He expressed the belief that in addition to diplomatic efforts, international civil and political activists should be involved in advocating the Crimean cause worldwide.